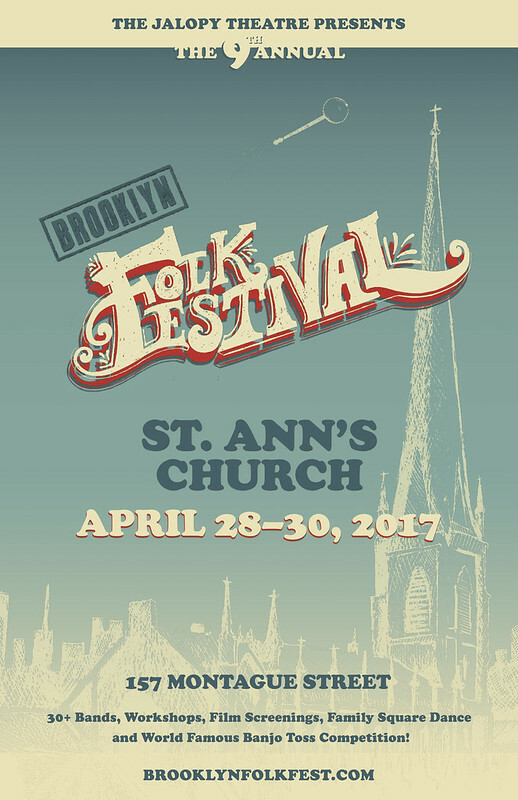 The Jalopy Theatre & School of Music, together with Down Home Radio is proud to announce the 2017 Brooklyn Folk Festival! We have a great festival coming up for you this year. 8pm – Anne Waldman – Acclaimed poet will open the festival. 9:45pm – Thunderbird American Indian Dancers – Songs and dances from the Mohawk, Hopi, Winnebago and other traditions. 11:45pm – Tennessee Stiff Legs – Western swing band, from Tennessee! First time in NY! 10:15pm – The Freakniks – Original and traditional music, from LA, CA! 11pm – Skalopy – Jalopy’s in-house ska band! 1:30pm – Martha Burns – Old time songs and ballads, from the mountains and range! 2:15pm – Brotherhood of the Jug Band Blues – Original and traditional jug band music! 3pm – Spitzer Space Telescope – original and traditional old-time fiddle tunes, English/Irish ballads and sea shanties. 5:15pm – Bill & the Belles – Oldtime, early Country and popular songs and tunes! 6pm – Amythyst Kiah – Traditional and original blues and folk songs from Johnson City, TN, first NY appearance! 2:15pm – The Hayrollers – Bluegrass songs and tunes! 4:30 – “Hard Hitting Songs for Hard Hit People” with Mat Callahan & Yvonne Moore – Celebrating the 50th anniversary of the publication or Lomax, Seeger and Guthrie influential and classic book! 6pm – Harmonica Contest – Who is the best harp player in NYC!?!? – Trip Henderson – Judge! 2pm – DIY Instrument building with Zeke Leonard. Build your own homemade instruments! Kid friendly. 3pm – Book Reading & Discussion: The Explosion of Deferred Dreams: Musical Renaissance and Social Revolution in San Francisco, 1965–1975, a critical re-examination of the interwoven political and musical happenings in the Sixties – with author Mat Callahan. 4pm – FILM: The Mountain Music Project – Exploring similarities between Southern Appalachians music and that of the Nepali musician caste in the Himalayas, includes Q&A with filmmaker Tara Linhart. 7:15pm – The Calamity Janes – Old time string band! 9:30pm – Rev. Billy and the Stop Shopping Choir – Wild anti-consumerist gospel choir and Earth loving evangelist sermonizing! 11:30 The Big Dixie Swingers – Western Swing, all the way from New Orleans! First NYC performance! 7pm – Main Squeeze Orchestra – All female accordion orchestra! 2:30pm – Deedle Deedle Dees – Fun kids music, with themes from history!! 6:15pm – Locust Honey String Band – String band, all the way from Tennessee! 4:45pm – The Jalopy Choir – Singing Balkan vocal music! 5:30pm – Square Dance with the 5-Mile String Band – Alex Kramer calling! 6:30pm – The Whiskey Spitters – Jalopy’s own in-house string band! 2pm – “Sing Like the Carter Family” – Learn to sing songs in 3-part harmony the way the original Carter Family did. Taught by Martha Burns. 4pm – FILM: Shake ‘Em On Down – Documentary film about legendary blues musician Mississippi Fred McDowell, includes Q&A with filmmaker Scott Baretta. 5:30pm – 10pm – Special art installation and performance with Anna Roberts-Gevalt, Elizabeth LaPrelle and Tim Eriksen. 1PM SPECIAL EVENT: THE BANJO TOSS – Banjo Throwing Contest!